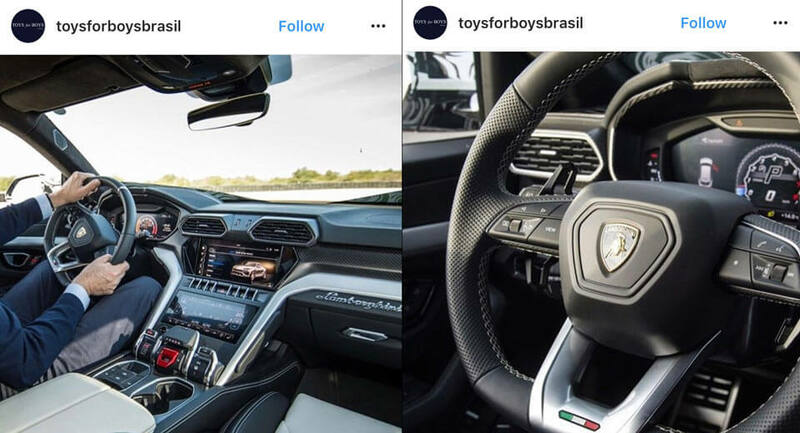 Lamborghini is counting down the days to the unveiling of the Urus and we're getting a better glimpse of the interior thanks to several photos that were posted to Instagram. As you can see, the Urus will have a bespoke cabin that shares little with platform mates such as the Bentley Bentayga and Porsche Cayenne. Instead, drivers will be treated to a sporty cabin that features a flat-bottomed steering wheel, carbon fiber trim, and metallic accents. Perhaps the most noticeable feature is the three different displays for the instrument cluster, infotainment system, and climate control system. The latter display resides above a large Anima (Soul) selector that provides easy access to the Urus' six different driving modes. Other notable features include two-tone leather seats, contrast stitching, and a prominent Lamborghini badge on the passenger side of the dashboard. We can also see hexagonal air vents and unique switchgear. The Urus will be unveiled on December 4th and it is expected to be powered by a twin-turbo 4.0-liter V8 engine that produces approximately 650 hp (484 kW) and 627 lb-ft (849 Nm) of torque. This will reportedly enable the crossover to accelerate from 0-62 mph (0-100 km/h) in less than 3.7 seconds and hit a top speed in excess of 188 mph (302 km/h). Thanks to Nathan for the tip!